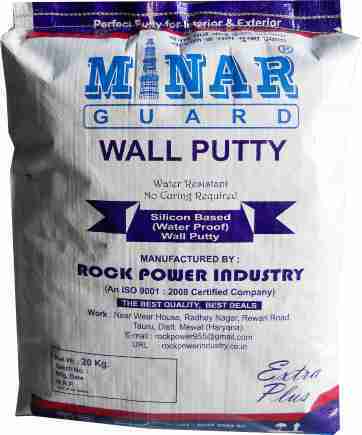 Providing you the best range of rock power smooth wall and minar guard wall putty with effective & timely delivery. As per the miscellaneous requirements and needs of our customers, we are providing our customers the finest range of Wall Putty. This product is extensively used in construction industry, ready mix concrete industry, fly ash bricks industry and road projects. Moreover, These products are also used extensively in glazing for fixing and sealing panes of glass into wooden frames, although its use is decreasing with the prevalence of PVC and metal window frames which use synthetic sealants such as silicone. In addition to this, our Offered product is accessible in varied packaging sizes as per the wants of clients. We provide these products to the customers at inexpensive prices. We are one of the prominent manufacturers and suppliers of Wall Putty for Home. It is a powder base substance which gives an excellent base for the walls and ceiling of cement or concrete. 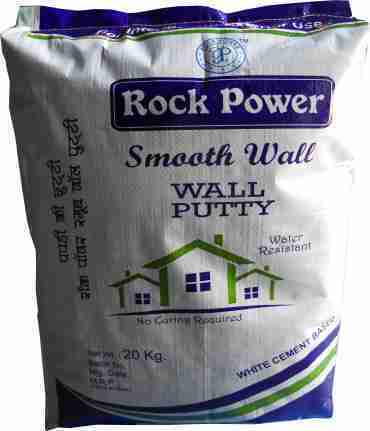 Wall putty help to give a beautiful look to walls it also gives a smooth finish and damp resistance also. Due to which painting of surface become much easier. The Wall Putty can be tinted to match the shades of the top coat.